You’ve taken on the role as the personal representative for a loved one’s life and the home included in the San Diego probate. The first step is to get experienced help from someone, like me, that has helped many San Diego probate executors, administrators and trustees through the process with devising a plan of action. Experience shows that once cherished mementos are collected along with items of financial value, the remaining 90 percent of a loved one’s belongings in the San Diego probate will need to be addressed. When the loved one has lived in a home for decades, this means there is a lot. One of my clients, Carol, shared with me that her Dad had told her to “do whatever you need to do” with his household belongings because he told her that the goal was to clear the house out so that it could be sold. She said that he wanted her to let go of the house and all of its contents so that the proceeds were easily accessible to she and her brother. Carol, as the executor of her father’s estate, had gladly taken on the huge responsibility of maintaining her father’s home until the San Diego probate court had completed the appointing of Carol. Once she received her Letters of Administration, it was time to address the preparation of the home for sale. Carol told me that she was glad that she was taking care of all this for her Dad because she wanted to honor him and the life that he had with their Mom. And she wanted to do it well. She was ready to begin to tackle the sorting through of all the items. Carol needed a strategy, and an efficient game plan. Since her parent’s home was in San Diego probate and she lived in Boston, plus she had her own family that relied on her, she wanted to be realistic about home much time she could devote to the task. She wanted to be cautious about getting to the home in San Diego probate and becoming paralyzed. She scheduled a week to travel to San Diego, address the situation and begin the process. She arrived and went directly to her parent’s home. The moment she walked in the front door of the San Diego probate home, she started to feel unsure and by the time she walked through the home and garage, she went straight into being completely overwhelmed. Just as she was beginning to feel defeated, I arrived ready to answer all her questions and be her guide by her side. When Carol looked at the fully loaded three bedroom, two bathroom home as a whole, she began to wonder how she would ever handle everything. She felt a bit better when we met because we started with a room-by-room review. We drafted a plan of action for each space. As we walked through the home, we talked about the items, as well as, cost-effective repairs that would prepare the home so that San Diego homebuyers would be attracted. Carol continued to be reminded that her Dad told her to “do whatever you need to do”. Over the past two decades, I have made homes full of stuff part of my business. Many San Diego probate executors and administrators, as well as trustees, are unsure of what to throw away, pack away or sell. Then they are equally unsure of how much items might be worth. It all starts with sifting and sorting through everything. Some San Diego probate executors or administrators choose to have others such as professional organizers help them, but in this case, Carol was ready for the job. 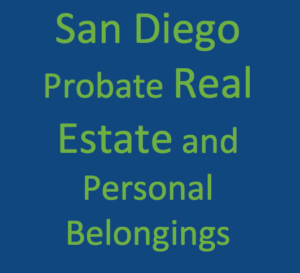 Most San Diego probate homes have tools, jewelry, linens, clothing, letters and photos, hundreds of random objects that once meant something to their loved one, not to mention the furniture. Although it can be emotionally taxing, most San Diego probate executors and administrators want to liquidate many of these items. Again, Carol kept reminding herself that her Dad told her to “do whatever you need to do”. She told me that the word “liquidate” began to sink in and changed the way she was feeling. Beginning the process of preserving some of her Mom’s and Dad’s treasured items, especially the ones with little monetary value was how she stared the process. She realized that once she allowed herself some time to be sentimental, she could then adjust to being practical. The tactic worked brilliantly for Carol! Carol now had the mental filter to handle the home in San Diego probate and her parent’s personal belongings. She began to sort through the items swiftly and decisively. Having me as a guide by her side to help her through the San Diego probate process while honoring her parents was key. And the key of having my team and me as that guide by her side helped her to be respectful of her parent’s belongings and her family history without burdening her future with a myriad of things that as she said “a sappy sentimentalist just can’t let go”. Bottom line is that Carol got the help she needed to support her while she processed her next, best step through the San Diego probate process. She was supported by my team and me to stay focused on her goal, to “do whatever you need to do” to clear out, to liquidate, and to then prepare the family home for a successful sale. Kim has been actively involved with real estate for 17 years. As far back as 1989, Kim and her husband, Dave, began purchasing and renovating residential property. They did this while working full time and raising four children. From these experiences Kim learned valuable critical thinking skills, successful multi-tasking, and how to nurture relationships. Their children have grown into independent, well-adjusted young adults, so those skills seem to have paid off.